I bought this two unwritten postcards today at the Geschichtsmarkt Dresden (Market of History), an unique place where people interested not professional in local history can discuss their projects. And you have the chance to buy old postcards, literature and other papers about the region. It remembers a public forum and I like visiting it every year. The Filmtheater Prager Straße was opened on 7th October 1972 - the national holiday of the German Democratic Republic (GDR - East Germany). 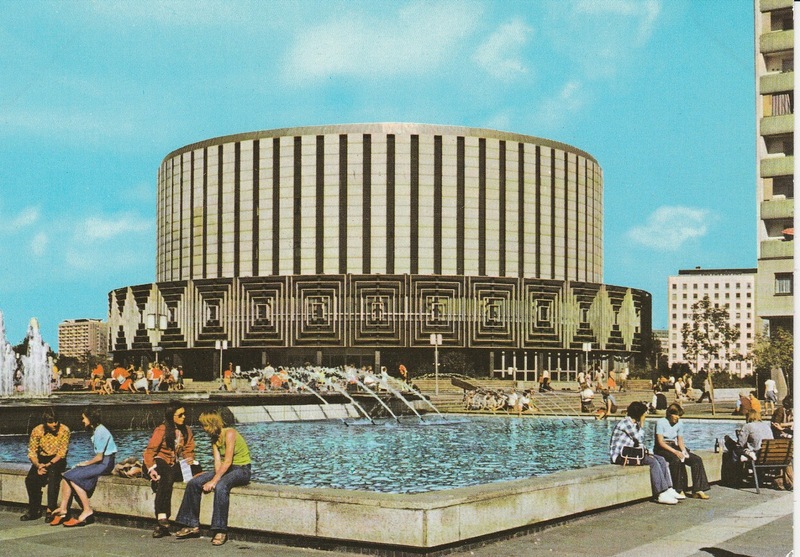 It was the largest cinema in the GDR with a big hall with 1.018 seats and a small hall with 132 seats. Even this building is a classical rotunda it is not an IMAX cinema or something like this. But there was the possibility to play movies in 70 mm. In the late 1990s I saw there the great movie 2001: A Space Odyssey by Stanley Kubrick in 70 mm. I think today there isn't this technique anymore. 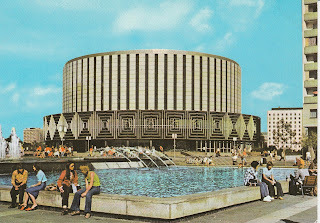 In 1990 the West German UFA got this cinema. They opened 5 new little halls in the basement. In summer 2002 the flood destroyed the cinemas in the basement. Financial problems followed. Since 2011 this cinema belongs to the Cineplex group and has now at all 5 halls with 1.400 places. The building itself has been a listed monument since 2003. The cinema was fanciless named after the street. But the people called it soon Rundkino - round cinema. This has been the official name since 2011. 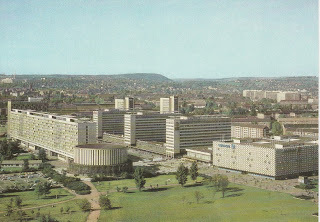 The first, the upper postcard was published in 1978. The second is from 1984, it is a view from the town hall tower. At the postcards you can see very well the idea of the architecture: the round building between the angled buildings and the free places and space between them. Today there isn't so much free space because of many new buildings. And there isn't any new postcard with this monument.